Former Chester forward Don Weston died recently at the age of 70 our condolences go out to his family and friends. Don Weston (pictured in his Leeds playing days) played more than 250 Football League games in a 10 year career, with Chester being the last of six different sides he represented. The Mansfield born inside forward was recommended to Wrexham while doing his National Service in Rhyl and after a successful season as an amateur signed professional terms for the Reds in June 1959. His shooting power and turn of speed soon brought him to the attention of the bigger clubs and in January 1960 he moved to Birmingham City for £12,000. By the end of the year he was on the move back north to Rotherham United where he represented the club in the first ever League Cup Final. 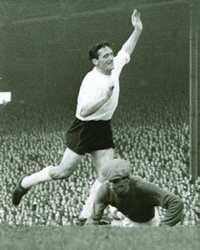 A move to Leeds United followed in December 1962 and started in sensational fashion with a debut hat-trick against Stoke City. In 1963/64 he finished as leading scorer at Elland Road as Leeds were promoted as Second Division champions. In October 1965 Don was transferred to Huddersfield before returning to Wrexham the following year. With 97 career goals to his credit Don was signed by Ken Roberts from Wrexham before the start of the 1968/69 season. Despite scoring in a pre-season fixture against Dumbarton he was named as a substitute for the first game against York and as the goals flowed freely for the Chester forwards he found it impossible to break into the side. After making his debut, as a substitute, at Bradford City Don made one other appearance from the bench before his only start, at Grimsby, in October. In January 1969 he moved into the Northern Premier League with Altrincham and scored a hat-trick on his debut. He wound down his playing career at Bethesda Athletic. After retiring from the game Don ran his own car sales business in Mansfield.